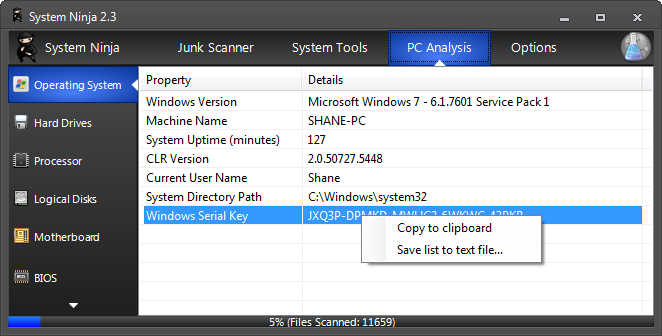 The System Analysis tool provides a quick glance at the software and hardware installed in your computer. The tool interacts with the Windows Management Instrumentation (WMI) service, which must be installed an enabled for the tool to function correctly. WMI is pre-installed on all Windows operating systems from Windows 2000 onwards. System Ninja can display certain important information about your installation of Windows. System Uptime, CLR Version, Windows Serial Key and other data is available. You can copy and of the available data to the Windows clipboard from the context menu, accessible by right clicking on an item. You can acquire information about the physical and virtual drives connected to your PC. 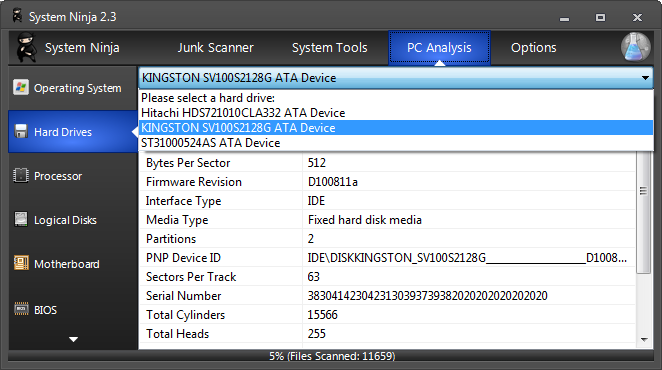 A list of available devices will be available from the dropdown menu on applicable System Analysis tab; where you can select a drive you would like to analyse.